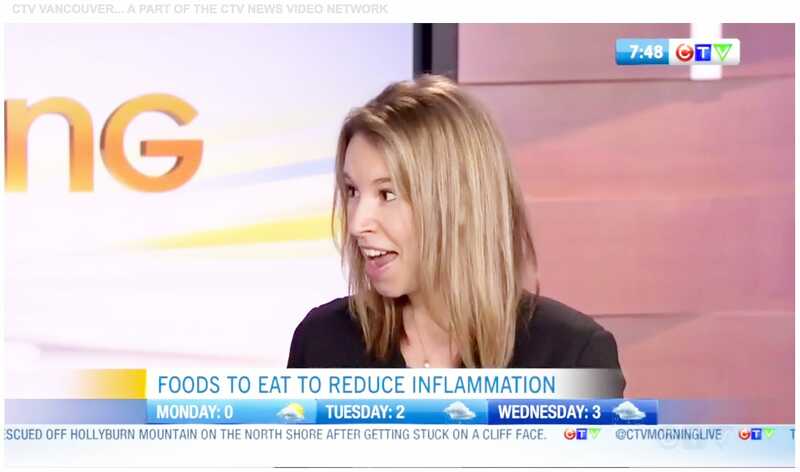 Last week, I had a CTV Morning Live spot all about the best foods and nutrients to reduce inflammation. You can click here to watch it. Inflammation is at the root of almost every health condition and you might not even realize you have it. Inflammation is our body eliciting an immune response. It’s actually a defense mechanism our body has to protect us from infection and injury. So, some inflammation is in fact necessary. The thing is, certain foods can create this same immune response in the body, and if you’re eating these foods regularly, this leads to a chronic immune response and therefore chronic inflammation. What are some of the foods you’d want to avoid? Vegetable oils high in omega-6 fatty acids, for example sunflower, safflower and soybean oils. Your specific food sensitivities matter as well and of course that’s something I can always test you for, but you know the usual suspects are gluten, cow's dairy and sugar. Lastly, for a very small percentage of the population that have autoimmune conditions or their inflammation shows up via arthritis and joint pain, nightshades can be a huge culprit. The nightshade family is your white potatoes, tomatoes, bell peppers and eggplants. Even just one week of removing them is often enough to notice improvements. What are the foods and nutrients that reduce inflammation? The first is turmeric which turns everything this amazing, bright yellow colour. One of the main active ingredients here is circumin, which is proven to be anti-inflammatory. I’ve got two turmeric recipes to share: a turmeric latte (that’s dairy free of course and I'll post shortly) and golden hummus! I mentioned that you want to reduce your intake of refined Omega 6 oils, but you also want to increase your intake of Omega 3s, which are anti-inflammatory. The one I use is Nutra Sea. It tastes good and you just need 1-2 teaspoons every day, with food. When it comes to reducing inflammation, the real focus is on foods that are high in antioxidants like your fruits and vegetables. If you suffer from inflammation, ask yourself if you are eating at LEAST 6 servings of vegetables every single day? If you need some inspiration for getting more veggies into your routine, head on over to the recipes section of the website.